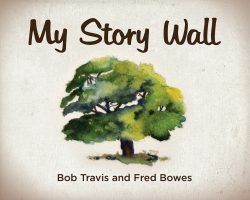 My Story Wall is a storytelling guide to help rekindle and share the precious memories of your loved one’s experiences. Inspired by Reminiscence Therapy, this book encourages families to ask questions about the past, record memories, and collect photos that capture the essence of each story. The photos are then used to create a personal wall mural. This unique approach to the tradition of storytelling fosters well-being and instills pride in our family stories, especially for seniors. Included in this book is a coupon code for three starter Wall Peppers ($15.00 value), an easily movable fabric decal for printing photos. You can reproduce your family’s photos on Wall Pepper to provide the visual connection that can continue the conversation and further the storytelling. Additional Wall Peppers can be purchased at www.pepperyourplace.com. We believe you will find the experience of creating your story wall rewarding and enriching for everyone involved. Bob Travis and Fred Bowes created and developed Wall Pepper in Plymouth, Wisconsin. Over the years, they had relatives and friends who moved to senior care settings and struggled with the transition. They missed their homes, which were filled with memories and meaning. Bob and Fred noticed that some of their customers used Wall Peppers to help create a familiar place with photos. Guided by the principles of Reminiscence Therapy, they developed a highly personalized process that encourages storytelling and engages residents with family members, caregivers, and visitors. My Story Wall is the result; a journal for those we love, to be used as a guide to uncover stories, select pictures, and create a vibrant space to celebrate life.